Once upon a time there lived a nice middle class family, right there on the fringes of maybe they could send their kids to college, or maybe not, depending upon if they bought the Marathon Bus RV they had always wanted, which they did, so Junior went to the local Junior College, and he thought the teachers sucked, so he quit. Junior spent most of his days lounging about his folk’s house, in his pajama bottoms and a tank top, eating Cheetos and playing video games, watching TV, and once in awhile, if his Mother begged long enough, Junior would mow the lawn, maybe dig a few weeds, but not before he would moan about it, and then he would wait for his Mom to get home from work, when she would make him a whole Totinos Pizza, which he would devour, a little snack before dinner. When Junior’s Dad would get home, dinner was served, and Junior, man, that dude could eat. Junior’s Mother and Father had taken to shopping at Costco, a sort of defensive move against Junior’s runaway eating habits, stocking up on those three packs of Baby Back Ribs, for example, since Junior could put away at least three entire racks on his own, along with a dozen corn on the cob, and at least an entire one of those Costco Deli Salads, the ones that come in those 7x11 black and clear domed containers, usually meant for 3 or 4 people to share. Dessert, later with TV, maybe Monday Night Football, or The Best Damn Sports Show Period, might consist of an entire coconut cream pie, and frequently a half gallon of Lucerne Chocolate Chip Ice Cream, peeled from its box after exactly 31 seconds in the microwave, and plunked down for easier access onto a green glass serving platter, once reserved for carved turkey, or roast beef. After he quit school, Junior’s folks began to worry that their son was bound for slackdom, but they tried hard to not think about it, as they loaded up their RV for their next trip down the highway, bound for some noisy Washington State Campground, where Junior would consume several barbecued chickens, or 15 hot dogs, trimmed with relish, saurkraut, mustard, and mounds of sliced jalepenos. In bed at night, in the back of the bus, Junior’s Mom would confess her fears, teary-eyed, to her husband, whose comments didn’t help much, except when he would tenderly suggest that, at least, Junior had not shown any interest in becoming a mime. “True”, Junior’s Mom would reply, more contentedly, and roll over to find the Kleenex on her genuine oak laminate nightstand. Now, I know there are people out there, like Junior, who truly get passionate about stuffing themselves, but, to be honest, I don’t understand it. And I have a hunch that most medical professionals would tend to agree that competitve eating is more than just a little crazy, given the artery clogging and stomach stretching and colon cramming such a competition bestows. Fro m 1986 to 1991, I ran a pie eating contest, each summer during “Fremont Fest”, a local festival, at my business, “Favourites Bakery”, in Portland, Oregon. After watching paricipants suffer greatly for the marginal kudos and prizes they might win, (We usually gave away a gift certificate to the winner) I finally decided I could no longer abide such a debacle. 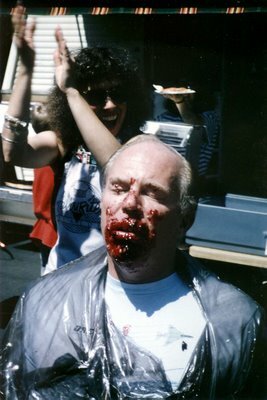 Just the sight of someone like two time winner Paul Geiger, pictured here, stuck somewhere between ecstasy and hurl, was enough to turn me against competitive eating. In the top picture, current popular Portland City Commissioner Erik Sten and his brother Matt enjoy diggin’ deep for more cherries, in their younger (and hungrier) days. Check out The International Federation Of Competitive Eating website, these guys are serious.